The Autoquip Fluid Regulator is designed to provide extremely accurate fluid regulation for automatic coating applications. Our unique design has eliminated the spring from the fluid section, significantly enhancing performance. Our springless fluid regulator greatly reduces the amount of trapped resins, significantly reducing flushing time and spent solvents during color change. Pilot signals can modulate the regulator’s diaphragm to control the amount of paint being delivered from the regulator to the spray applicator. 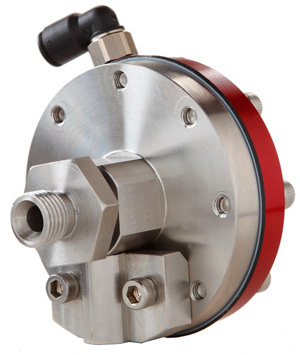 Manually operated or electronically controlled air pressure regulators can be utilized to control the pilot signal for pumps, tanks, or any size circulation system. Its stainless steel and teflon coated wetted parts also make it highly durable for long-lasting performance.